This double layered knitted hood hat is sure to keep you warm on the coldest of days! Ready? Here's what you need. This is two separate pieces knitted on a machine, then folded in half so it is warm. 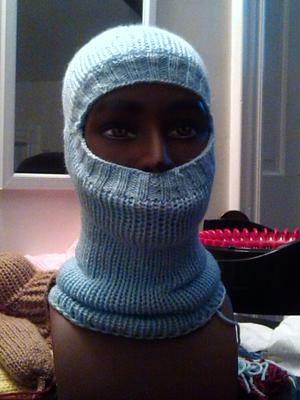 The hood is a total of 48 rounds, then bind off and put aside. The neck (as shown in this photo) was a total of 120 rounds knit, then binded off. Increase or decrease rounds to fit as desired. Put on the neck piece and hood piece to measure in front of each ear, then attach together both hood and neck piece with a safety pin in back of head. With a slip stitch or overcast stitch, join both head and neck pieces where they are folded in half. To make the ribbing around the face, knit as follows with size 13 DP needles: (Knit 2 ,Purl 2) for 20 rounds or as desired. If needed, decrease at both vertical ends of face opening. For top of the head, join stitches securely, neck opening crochet around. Love this project! Thank you for sharing Connie. It looks so warm!